Would You Get a Watercolor Fox Tattoo or a Regular One? A watercolor fox tattoo looks a lot like a watercolor painting, but it still retains the quality of a tattoo. It follows the same steps as creating a traditional tattoo, but is hard to distinguish from a painting. Unlike a regular tattoo that incorporates strong and defined lines, the colors on this particular tattoo are more gradual. We can easily tell when a tattoo takes on this style by looking at the black outline. There should be none on this tattoo, so the outcome would be a lot like a painting. Is it easy to draw a tattoo like this? It’s actually very challenging as the tattoo artist has to guess precisely where and how to combine different shades of the same color. With a regular tattoo, there’s a black outline that would guide the artist until the art is finished. He probably needs to make a stencil first to make sure that the colors are properly positioned next to each other. He could start with the darkest color to the lightest. When it comes to recognition, traditional tattoos are more popular because people are exposed to them more. However, getting a watercolor fox tattoo is a way to go just because it looks different. You’d easily grab people’s attention with this artwork on your skin. 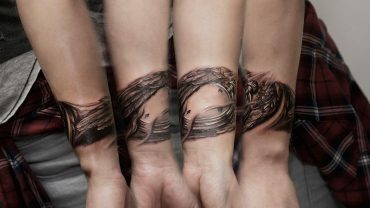 It looks as if as painter got the job done when in reality it’s a tattoo artist that has improved his skill doing it. Colors are also more vibrant on these tattoos for an apparent reason. Black is a common color for tattoos. Nearly every tattoo has this one. A watercolor tattoo, despite the absence of black (or the lack thereof), still has a unique personality as it uses a broad range of colors. You can include both strong and soft colors in the same tattoo. There are some shortcomings that you should take into account. A black outline plays a big part in maintaining the concept of a tattoo. As time goes by, a big portion of the colors will start to fade, leaving the outline intact. You’d start noticing the difference in a couple of years. Now that a watercolor tattoo doesn’t use this and instead, only uses shades, over time it will be less and less clear. As a result, the essence or the original concept will fade, too. Besides, people aren’t so sure if this tattoo design style can stand the test of time. Some styles will likely wane and go out of style. By the time your tattoo is a few decades old, it will look outdated had you picked a wrong style to begin with. While touch-ups are possible, without the clear outline, it will still be harder unless your new tattoo artist is exceptionally talented. What are Black And White Skull Tattoos all About? Spiritus Tattoo Copyright © 2019.